The Colorado Crane Conservation Coalition (CCCC) is dedicated to the conservation and protection of Sandhill Cranes in Colorado. The Greater Sandhill Crane is an iconic species of the Yampa Valley in Northwest Colorado. 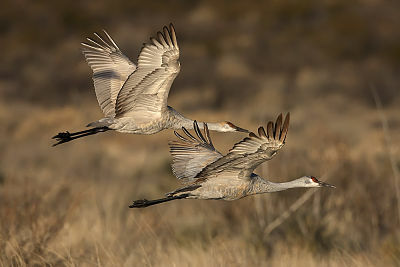 Returning in the spring from wintering grounds in New Mexico and Arizona, cranes nest and raise their young in wetland areas throughout the valley. At summer’s end during the peak of their stopover in the Yampa Valley, we present our annual crane festival. The purpose of the Yampa Valley Crane Festival is to educate the public about these ancient birds and to celebrate their presence in Northwest Colorado. Aldo Leopold, the famous conservationist, wrote in a Sand County Almanac, “our appreciation for the crane grows with the slow unraveling of earthly history. His tribe, we now know, stems out of the remote Eocene. The other members of the fauna in which he originated are long since entombed within the hills. When we hear his call we hear no mere bird. We hear the trumpet in the orchestra of evolution. He is the symbol of our untamable past, of that incredible sweep of millennia which underlies and conditions the daily affairs of birds and men.” Once you have heard the call of a crane, you will remember it forever. To learn more about our other programs, please explore the rest of this website. CCCC is now a participant in the CO Gives/Yampa Valley Gives Day. The First Crane Sighting Contest has been extended through April 7, 2019. Click here for details. Save the dates for the 8th annual Yampa Valley Crane Festival: Aug. 29 – Sept.1, 2019. Click here for the latest festival information. 1) The First Crane Sighting Contest takes place during March. Click here for details. 2) The Crane Creative Arts Contest for Routt and Moffat County High School seniors is underway. $5000 in scholarships will be awarded to winners of the contest. Click here for all details and contest rules. 3) The 2019 Crane Photo Contest extends from September 2018 to Aug. 13, 2019. Click here for contest information and rules.